This is Sir Bootz, a shelter cat from Pets Alive Westchester, added to the rectory population yesterday. He is a fine clerical fellow, right at home on my keyboard, in fact blocking the screen at this very moment. He has a very sweet disposition, and is fascinated by my typing on the keyboard... Perhaps I can put him to work? This is my father and mother, William and Mary Haller, both in uniform (Army and Navy respectively). They met during, and I suppose it fair to say, because of, the Second World War. They were together as a married couple for almost fifty years. Both are interred in the “Patriots’ Hill” section of the suburban cemetery dedicated to Veterans, not too terribly far from where my siblings and I grew up. 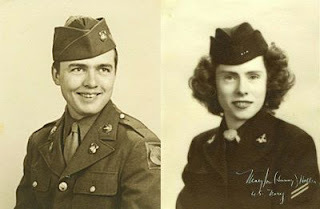 On this Veterans Day (Armistice Day, or by whatever name you choose to know it) I give special thanks for my Mom and Dad, who served their country in wartime, and loved it in peacetime. So I do have to wonder why the error-prone talking heads are still nattering away on the airwaves and intertubes, and why anyone would listen to them for any other reason than to assuage their own disappointment by listening to the echoes of their ideology. Perhaps that is reason in itself. Misery loves company, the old saying has it. Meanwhile, it is time for the country to pick itself up, dust itself off, and get to work. The Republican members of Congress should realize that obstruction will not be long tolerated, and for most of you the next election is in two years. It is time to lead, follow, or get out of the way. Mr. President, you have our attention. UPDATE: See this graphic from the inimitable folks at Slate.com. It is a graphic display of who among the pundits did well or poorly in their estimations. The fact that Conservative pundits were more "off" than the moderates or liberals testifies to the stupifying effects of their ideology. This is a repeat posting, but I think it worth repeating.